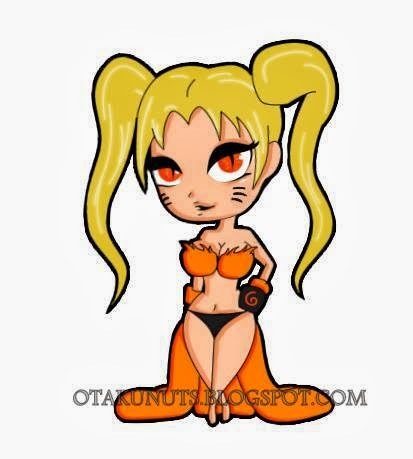 This is just intentionally weird! 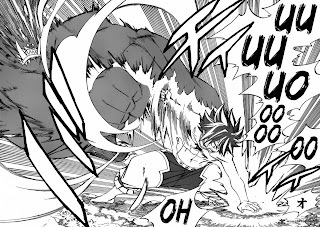 After discovering last week's twist with Doriate being one of the demons from the Book of Zeref, we now see Gray fight him in a battle I personally felt was a bit too short for such a scary figure. Once Doriate gives Gray a slap, he then does a screech. This turns everyone back into kids again, but also all those who weren't kids before. To put it simply, every character is a cutie and that includes Flare and Minerva and even those Treasure Hunters who are still slightly unconscious. Happy and Carla arrive by crashing into Gray's battle. Now they are young, they can no longer fly as high or skillfully as they usually do in their proper ages. Due to Gray's age change he is now crap at both attack and defense, and after taking one hit he realises he is pretty much doomed. Before he is struck, he starts to think of a way to defeat Doriate, remembering the first half of this battle from last week's chapter. Happy and Carla save Gray before he is crushed, but they know they aren't going to be able to help much more than this. Gray notices how Doriate couldn't break the bushes made of ice last week and refuses to touch any of the ice despite being a mega-demon right now. Clearly, the ice is his weakness although we have yet to discover why that is or what makes this ice so special. Gray gets sick of freaking out due to being reminded of Deliora all the time and finally steps up to take down Doriate. He puts his hand down and channels the ice through himself to blast Doriate with it. Victory is achieved as Happy, Carla and Gray are seen returning to normal and Doriate goes back to his original form. Before the chapter ends, we see Gray wondering about the ice and Doriate's true form. Doriate seems to be about to do a villain rant about how "Hell's Gate is open" because of Gray (or possibly his group) but then he is swallowed by Minerva's one-eyed bat which has now grown huge. Yes, you read that right. All in all, not a bad chapter and one that definetly raises even more questions. Where did the ice come from? Why is Doriate so weak against it? Does this ice have something to do with Deliora and Ur? 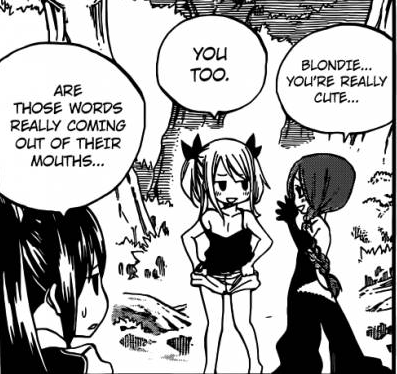 At least Hiro Mashima is making this arc a bit more exciting but it's going to be quite an annoying time before we get all the answers. 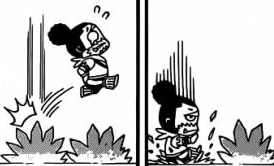 I also hope that's not the end of seeing everyone as kids because I personally would find it very random and pointless if Minerva was a kid for one panel and then never again. Overall Character of the Week: Gray Fullbuster for his fight against Doriate and regaining his self-confidence. Predictions: Next week will be a Natsu week where he finds the Eternal Flame. Doriate will still be alive, just inside a giant bat-thing. For some lazy reason, only Gray, Happy and Carla will be back to normal but that will just be so Hiro Mashima can have more fun or create silly suspense. 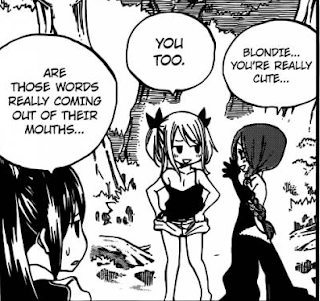 Lucy might actually realise she's a lesbian and upset NaLu fans everywhere. P.S Remind you of anyone? Shiggins enjoys all strange forms of communication, especially those including cosplayers saying hello to him. However, until that wonderful day comes, you can also contact him on his Skype; shigginsishere. He can also respond to you if you contact him through GMails at shigginsishere@gmail.com.